3 chambres, 3 salles de bains au bord du lac, situé au centre du lac Shuswap. Superbe maison de lac située à proximité du Cinnamouson Narrows, avec de belles vues sur la montagne. Escaliers à grande quai de forme octogonale, beaucoup de montagne aménagé avec foyer extérieur et une aire de jeux gazonnée. 3 étages, maison de 3 chambres, avec 3 salles de bain complètes. Étage principal de 1200 pieds carrés avec cuisine, salon et buanderie, foyer au bois, et grande terrasse donnant sur le lac. Sous-sol débrayage est une pleine salle de théâtre / jeux - table de billard, ping-pong, baby-foot ball & table de poker, aussi grande terrasse couverte avec tente pour les personnes supplémentaires. Master suite a une salle de bains complète, petite terrasse et foyer au bois. 2ème chambre a un lit queen size et 3ème chambre est plus petite, avec 2 lits jumeaux. 2 kayaks sont également disponibles. House est bien entretenu, nous sommes fiers d'offrir une maison de vacances très propre, avec toutes les commodités nécessaires pour rendre votre séjour aussi confortable que possible. VEUILLEZ VOUS ASSURER QUE LES PRIX QUE VOUS CONSULTEZ SONT INSCRITS EN DOLLARS CANADIENS. VBRO affiche souvent le prix en dollars américains si vous ne spécifiez pas la devise. La maison peut accueillir confortablement 6 personnes, et nous facturons 40 $ par personne et par nuit au-delà de 6 personnes. * Ponton Double Decker avec toboggan et nouvelle chaîne stéréo 2000 watts à louer sur demande. * Un bateau de ski de 19 pieds est disponible à la location ainsi que pour les plaisanciers expérimentés (avec permis de bateau) - demandez des informations au propriétaire. La maison est sur l'eau, situé à proximité de Cinnamous Narrows. Il y a un parc provincial à proximité avec des tables de pique-nique, un magasin flottant et un bar / restaurant flottant, où le carburant est également disponible. Il ya plusieurs domaines d'intérêt à proximité - nous aimons la randonnée pour Hunakwa lac de la fin de Ansty Arm - son un joli chemin étroit et cachée, mais de beaux paysages. En outre, il est à proximité des chutes au début de Seymour Arm pour la visualisation, et Albas tombe près de la fin de Seymour Arm (un autre randonnée stellaire!). Nous bénéficions également de la plage publique à proximité à Ansty Arm, et plus on à la fin de Seymour Arm (super pour les petits!). Vous êtes au centre du lac - c'est une promenade en bateau raisonnable à Sicamous, Mara Lake, Herald Park Falls et Salmon Arm, ou vous pouvez embarquer l'autre côté de Copper Island (un autre bon sentier de randonnée), Blind Bay et Scotch Creek . Il y a un service cellulaire limité (nous avons un booster), mais pas internet pour le moment. We had a fantastic week - the house has everything needed. The location is secluded and scenic. We spent a week with everyone from teens to grandma and we all enjoyed it. Rented the pontoon boat, which was fun for everyone and enjoyed the relaxation of an old school lake vacation. Shelley was incredibly responsive, the house was impeccable. We'd rent it again! Renting from Kevin and Shelley was a great experience. They were helpful, informative and provided everything we could possibly need. The little extras, like the kayaks, popcorn and wine bottles were very much appreciated. The house itself is quite secluded, which we loved. Heed everyone’s advice about a 4 wheel drive vehicle to avoid any mishaps on the road in. Once you’re there, there’s really no reason to leave. House is beautiful, modern and stocked with everything you could possibly need. The only thing that could be added is a hot tub, but I suspect the logistics of that would be a little tricky. Looking forward to a return trip! If you’re on the fence, get off and book this place! You will not regret it. If you're looking for an exceptionally beautiful home in a very private location this is it. We spent 2 weeks at Shelley and Kevin's Lake Home. The home is very well appointed and has everything you could possibly think of needing. The weather was perfect...we only had one cooler day so we spent very little time indoors. Most of our time was spent on the water kayaking and paddleboarding. Its a short paddle to the Provincial Park where there are a couple of hikes and the floating store. We loved having our morning coffee out on the deck.....so peaceful! I was a concerned about the drive it but had no problems negotiating the last kilometer. We would highly recommend the Lake Home if you are looking to get away from it all in an amazing setting...we will definitely return. 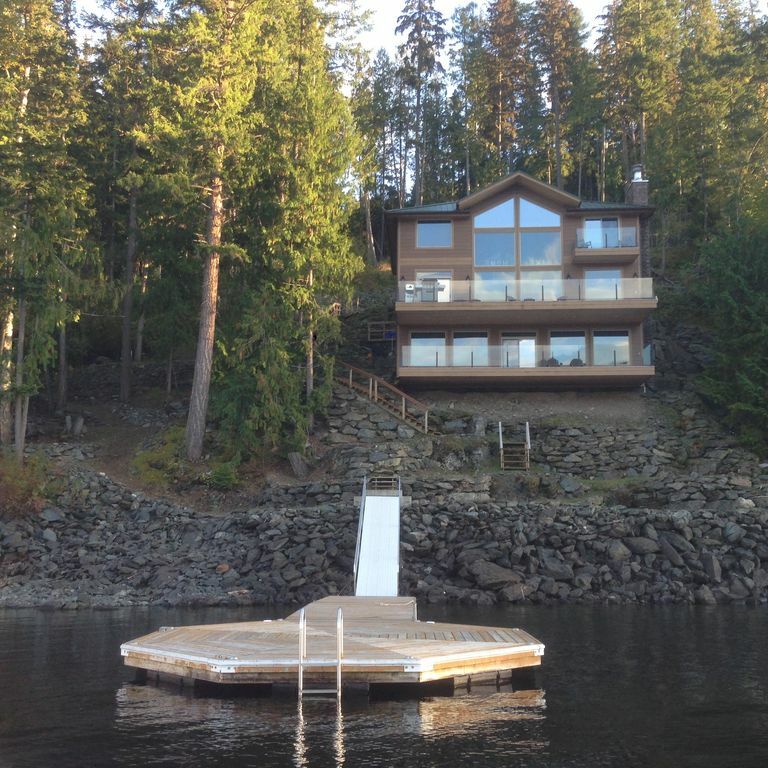 We were in awe when we entered this gorgeous home right on Shuswap Lake. The immediate view upon entry was stunning. The bedrooms were clean and modern, although the beds were a bit small for the four teenage girls. It was like a hotel, bottled water on the dresser, lovely sheets and white duvet (very clean). Washrooms were very modern and clean. Then we descended down the stairs to the main living space including living room, dining table and beautiful kitchen with all it's amenities. A coffee maker and a Tassimo!! The beautiful tree stump holding up the kitchen granite counter was amazing. Love the foosball table too! On the third floor we were amazed to see a ping pong/pool table and a huge theatre room complete with black out curtains, surround sound and huge comfortable chairs. We used this room a few evenings along with the popcorn maker. The stairs to the dock, while steep, did give us a bit of daily exercise (though not recommended for small children or elderly). The dock was big enough so that we didn't miss a beach. The girls loved laying out there during the day when we weren't out on the boat. This house was definitely built well with no expense spared. We will definitely come back. ps the last kilometer in is definitely 4x4 ONLY. A vacation house where you need nothing but food, drink, & good company!! This place has it all! Great location, amazing view, more supplied activities than you can utilize in a week, inside and out, you will not run out of things to do. Very gorgeous modern interior, many steep steps to work off all that "vacation food"! House is stocked with things you'd never expect, for your use. The last leg of the road in and drive way is no joke, but that's what also made this place great. Only thing missing would be a waterslide from the top deck to the lake ;), don't know if it's in the cards, but that'd be awesome! The owners of the property are great and very easy to work with! 6 adults and 3 small children, had a great time and plan to be back! Il y a un magasin flottant, un restaurant et un bar juste au coin de la rue Narrows. Ainsi que des plages publiques à proximité, des cascades et des randonnées accessibles par bateau. Nous avons maintenant aussi un bateau ponton de 2 étages avec un toboggan à louer. *PLEASE NOTE - DEPENDING ON WHAT SITE YOU ARE ON - RATES MAY BE LISTED IN US DOLLARS - BE SURE TO CHECK THE CURRENCY DISPLAY FOR ACCURATE PRICING. The last kilometre of the road in is very rough, a truck or SUV is recommended(4x4 is preferable) The stairs on the property were built into the terrain, and unfortunately are not standard size stairs - please be aware of this when using them. There is an additional charge of $40 per person/per night for additional guests over the 6 person maximum, prices will be adjusted manually. Check in is 4pm and Check out is 10am on the Saturday changeover day. Pontoon Boat rental available for a discounted rate with rental - please inquire. *Discounts available for returning guests.